“Found Properties” are reviews, interviews, writings and musings by Virginia Anderson. We’ve been spoiling you with good video. How about something quite different? 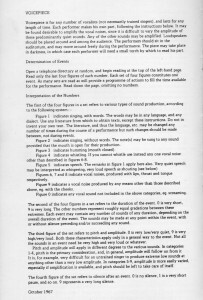 Here’s how not to perform an indeterminate verbal piece, supposedly Chris Hobbs’s 1967 classic Voicepiece, but coming out as something much noisier. We bring this to you as a cautionary tale: Kids! Don’t drink and perform experimental music! Stay away from YouTube if you do! What is very odd indeed is the use of the conducted beat. But we like the hats and the Hirst-dotty shower curtain. Cornelius Cardew’s Treatise (1963-67), is quite probably the biggest and most beautiful piece using graphic notation ever written. 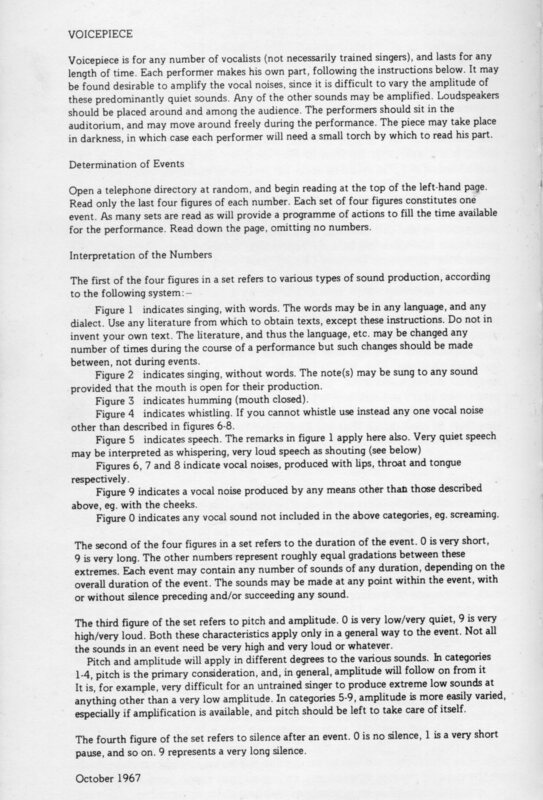 And because Cardew left Treatise to be interpreted freely —there are no instructions — performances range from the strictly dutiful (reading left to right, up for high, down for low, agreed responses to certain symbols such as numbers or circles) to the eccentric. Over the years students in various experimental and notation classes I have taught have come up with some really fine Treatise interpretations. One version for which I hold fondness and which exists on the web is by a former notation student, Ben Kennedy, who realised page 92 of Treatise as an assignment. Now I can’t remember the exact criteria he used (if you read this, Ben, do tell us! ), but his realisation has the practicality and the ingenious social approach to indeterminacy that occurred in the best work of the Scratch Orchestra. As I remember it, Ben used friends and flatmates who were not music students, but were enthusiastic electric guitar players. He explained the piece briefly, but (I think) gave no strict instructions for the interpretation of the page (other than to give them a time frame to do it). And here’s the kicker: he contacted and recorded each of the four guitarists separately, then combined them for the ‘performance’ (actually, more like record production or minimalist mixing), so that what comes out in total could not have been predicted by each player. It’s a kind of obscure heterophony, I suppose, given their responses to the same stimulus. But since the guitarists use a soundworld typical of their kind, whilst avoiding cliché, it’s just a happy version of Treatise. Here are the results of the jury…. Here are some more videos that might tickle your fancy, from the energetic folks at FZML Leipzig. Over the last several days, Leipzig has been celebrating Cage’s 100th birthday (http://www.cage100.com/english/cage100/information/) with their Water Music Project (http://www.cage100.com/english/projects/water-music-project/), in which loads of pianists in a whole load of cities (Addis Ababa, Kiev, Brno, Birmingham (England,not Alabama), Thessaloniki, Bologna, and other places) perform Cage’s Water Music (1952), his first really theatrical piece, which are then streamed to their site and held there and on their YouTube channel (http://www.youtube.com/user/FZMLLeipzig?feature=watch). Finally, both Brno and Thessaloniki prefaced their submissions with travelogue advertorials for their cities, like one gets before contestants perform on the Eurovision Song Contest. Perhaps you could have a home Water Music party, in which you judge your favourite entry, just like Eurovision. * If so, do let us know about it! At the moment, the Birmingham performance is almost inaudible on YouTube and is not playable on the Leipzig site, but this should be fixed soon. We’re looking forward to collecting the whole set! *For our non-European friends, that’s the meaning of this post’s title. The judging for this contest always was broadcast through calls to the host city from the participating countries — ‘Hello, London, here are the results of the Belgian jury…’. Video: The Sound and the Fury: A Century of Music, especially Episode 3: Easy Listening? Dir. Ian MacMillan; prod. Roy Ackerman (OU/BBC co-production, BBC4, <http://www.bbc.co.uk/programmes/b01qnp5f>). In ‘History Lesson’ by Arthur C. Clarke, Venusian archaeologists find the only record of Earth life, five thousand years after its demise, in a film canister, from which they interpret (quite wrongly, as it turns out) how Earth creatures lived (if you haven’t read this short story, you can read it here — http://web.math.pmf.unizg.hr/~veky/T/T1/historylesson.txt — or if you don’t mind spoilers, follow the footnote).1 I was reminded of this story whilst viewing The Sound and the Fury, a series of three programmes produced by the BBC and the Open University in association with The Rest is Noise season of concerts at the Southbank Centre. This is a curious show: a history written without knowledge or much enthusiasm. It’s as if the alien archaeologists not only don’t understand their find, they don’t really like it. However, these moments appear in the series untethered to each other, and without a sense of curiosity. I constantly had to fill in the story with my own knowledge. In the minimalism episode, Kyle Gann delightfully mooched about the Maverick Arts Center in Woodstock, New York, a rustic outdoor performance space in which David Tudor premiered Cage’s 4’33” in 1952. We could see performers playing Tudor’s reconstruction of the first version of 4’33”, but we heard nothing about its notation. Tilson Thomas told a fascinating story about watching Morton Feldman composing. Why was he watching what would be, for most composers, a private activity? Many of the clips — Cage on I’ve Got a Secret, Schoenberg and Gershwin playing tennis, the sound of Charles Ives singing — are easily found on YouTube and other internet sites, often with more explanation. The segment on Terry Riley’s In C is interspersed with archive footage of Haight-Ashbury hippies and a musical track by the Grateful Dead. The connection between the two could be shown, but it isn’t. New York minimalism is illustrated with a brief clip of John Coltrane performing. Again, no connection is given: Reich and Glass said they liked jazz, and that was it. In fact, the treatment of the relationship between jazz and modern music throughout this series consists only of Stanley Crouch talking about Gershwin, but not African-American composers, and a brief still of Ellington to illustrate what the Nazis considered ‘degenerate art’. If I knew nothing about modern music I doubt whether this series would make sense. Once an expert was engaged for their area of expertise in the twentieth century, they were often asked to comment on every area, whether they knew anything about it or not. George Benjamin seemed to be even-handed in his answers, if slightly puzzled to be asked. Tom Service, a champion of music complexity, presented his conflicted assessment of Cage and the minimalists.The few women witnesses included Gillian Moore of the Southbank Centre, Nuria Schoenberg-Nono, and Meredith Monk. Although billed highly in the advertising for this series as a minimalist composer, Monk only appeared in the first, early twentieth-century episode, saying how much she liked the Rite of Spring as a teenager. Nico Muhly commented once on minimalism, but not his own work or its context. Although many consider Muhly to be crucial to the legacy of minimalism, here he was just another talking head. The musical examples often didn’t fit the argument that was being made in the narrative. In the first example of the first episode, the narrator talked over the dissonant Salome chord in Richard Strauss’s opera, triumphantly shutting up in time for us to hear its resolution. Messiaen’s Quator de la fin du temps is described as exemplifying the end of musical time as well as the Christian end of days. But this is illustrated with ‘Louange à l’éternité de Jésus’, a cello and piano duo in which the pianist plays trudging chords throughout, marking the endless time of eternity like a metronome. A discussion of Feldman’s extremely slow tempos and sparse brand of minimalism in the 1960s and 1970s is illustrated with For Philip Guston (1984), a relatively fast piece (about 68 bpm) from his later, busier, period. While it would be impossible to be comprehensive in three hours, much of the missing information is crucial to any history of the century. We heard nothing of Satie, for instance, whose musique d’ameublement and Vexations would have provided precedents for the minimalist episode. There were some brief shots of scores, but the wide variety of experiments with, and extensions to, notation throughout the twentieth century was completely absent. This is where the coverage of British music in this British series falls short. After a short apologia about the squareness of the British ‘cow pat’ scene, Maxwell Davies and Birtwistle appear in the second episode, represented by a few stills of their theatre music. John Tavener appeared as the only representative of British minimalism, accompanied by a clip of him sporting a very dashing Carnaby Street dandy outfit. But in this clip he plays a modernist piece, not minimalism. There is no sign of Cornelius Cardew, whose notation alone was so much more ‘out there’ than other British composers, whose Treatise is not only the best but the most beautiful graphic score, and whose Great Learning links indeterminacy and minimalism perfectly. No other British minimalists appeared: no Gavin Bryars, Howard Skempton, or Michael Nyman. Since the Experimental Music Catalogue is devoted to British minimalism, we may be biased here. But surely no one could condone the omission of La Monte Young, who is essential in any survey of minimalism. Yet Young neither appears in the series, nor in the educational material supplied by the Open University in association with this series. There are two general problems with this series. First, the director, Ian MacMillan and the academic supervisor, the Open University lecturer Ben Winters have not used written resources that are easily available, or taken advantage of the experts they had. Keith Potter’s Four Musical Minimalists: La Monte Young, Terry Riley, Steve Reich, Philip Glass, one of the main books on minimalism, demonstrates Young’s importance in the title. Common terminology is not used or it is used too loosely. The narrator repeatedly refers to ‘avant-garde experiments’ by a range of composers. What does this mean? Is it avant garde, experimental, indeterminate, serial, minimal? At times, the film and the Open University web site content clash. The abundance of women composers on the OU web site may be compensation for their absence from the film, but the list lacks consistent relevance. While Pauline Oliveros could sit well in any history of the twentieth century (and her absence highlights the woeful coverage of electronic music in the film), it is hard to argue for the inclusion of Amy Beach and Grace Williams in an avant-garde history. Had Gann been a consultant on the whole series (or any of another dozen or so scholars in the field), it could have improved immeasurably. As it stands, we wonder, what were they thinking? The second problem is that the film’s position doesn’t encourage us to like the twentieth century at all. The central message in The Sound and the Fury is that modernism is hard to understand and uncomfortable to listen to. They offer instead a kind of middle-brow, mid-level substitute as the next step in music. Eric Whitacre, composer of popular choir music and the additional music for Pirates of the Caribbean: On Stranger Tides, writes mainstream, almost educational music, but he was one of the most prominent experts appearing in the series. His ‘dynamic minimalism’, ‘which basically means that I love to employ repetitive patterns as long as they don’t get boring’,4 may be that next step. I am not the only one to get this message. So, too, do the right-wing, middle-brow press; for instance, this review — http://www.telegraph.co.uk/culture/tvandradio/tv-and-radio-reviews/9866855/The-Sound-and-the-Fury-A-Century-of-Modern-Music-BBC-Four-review.html — by Nigel Farndale, who allies it with Howard Goodall’s Story of Music, a programme that argues that serialism was a mistake. Both series give Farndale (who is not himself a musician) permission not to like modern music, so he gives them a rave review. As if this message is not hammered home enough, Julian Lloyd Webber is trotted on at the end of the film to say what a bad thing serialism was, and we leave with Adams’ tuneful Harmonielehre, performed in a parking garage. There is a kind of ‘gee, whiz’ breathlessness from some participants, particularly Alex Ross, whose The Rest is Noise book title was taken for the South Bank music performance series associated with The Sound and the Fury. Ross’s book is, admittedly, shallow and simplistic — it appeals mainly to readers who know nothing of the subject — but at least Ross is enthusiastic about his subject. The Rest is Noise plays on Hamlet’s soliloquy, ‘the rest is silence’, on Cage’s book Silence, and, perhaps to the great fun of simple noise (‘make a joyful noise unto the Lord, all you lands’). The Sound and the Fury, on the other hand, references Macbeth: ‘. . . a tale. Told by an idiot, full of sound and fury. Signifying nothing’.4 The title choice underlines the fact that the filmmakers are not so enthusiastic as Ross. We are given permission that once we go through this programme, we’ll know enough never to have to listen to this music again, as it signifies nothing. But then who, I wonder, is the teller of tales in the reference? The composers? Or the filmmakers? The treatment of the subject suggests the latter. I’m sorry this is such a grumpy, humourless assessment, but the film is so grumpy and humourless about the subject. I haven’t been fond of Darmstadt or the ‘uptown’ New York avant-garde composers since I was a teenager. I grew to prefer the wittier and philosophically more complex approaches of experimentalism, minimalism, and postminimalism, and increasingly tired of the positivism and self-importance of the avant garde. But it is almost impossible to trust anything in this film. It is one thing to study evil subjects. One of the more coherent segments of this series occurs in the second episode, about the damage perpetrated on music by Hitler, Stalin, and McCarthy. However, it is quite another thing to base a series on a personal hatred and suspicion of a musical style. Watching The Sound and the Fury almost makes me want to act like my teenage self when adults told me something that I perceived to be restrictive or illogical — do the exact opposite. Maybe I should reach for some good old uncompromising abstract music like Milton Babbitt.5 If this film says it’s that bad, it’s got to be better than I thought it was. 1 The legend at the end of the film, which featured great violence, speed, and a seeming disregard of natural laws, read: ‘A Walt Disney Production’. It was an animated cartoon. And Rosebud was a sled. 2 It’s as if Adams had never, ever written experimental music like ‘John Phillip Sousa’ in American Standard (a piece which presents the rhythms, but not the pitches, for a march, in a collection named after a well-known toilet company). 3 <http://ericwhitacre.com/music-catalog/wind-symphony/equus>. The music is not objectionable, nor is it shockingly dissonant or boring. It sounds like much music for film or school use, despite its almost fanatical following. 4 Of course, this could also refer to the novel of the same name by William Faulkner. 5 Babbitt was also absent from this series. Author VirginiaPosted on 8 March 2013 13 August 2018 Categories Found Properties, Video Watch3 Comments on Video: The Sound and the Fury: A Century of Music, especially Episode 3: Easy Listening? The Canadian composer Jordan Nobles has made us aware of a performance by the Aventa Ensemble last December of Gavin Bryars’ The Sinking of the Titanic held in the Vancouver Aquatic Centre. Have a look at it here: http://vimeo.com/57017267 . Although it is hard to hear the music as clearly as one would like, I think this adds to the nostalgic and watery quality of the performance. One hears, almost, the testimony of survivors; the solos are more indistinct than they would be in a concert hall. All is so much more . . . watery. The wind players are positioned on the high diving platforms; the strings and percussion at poolside. The lighting is gloomy, with some green spots and lights from doorways, and with more natural lights on the performers. The main camera setting is on the side of the pool opposite the performers, where there are stands where the majority of the audience was sitting. But — and this is what you’re waiting for if you’ve had a peek at this video — the real feature of this performance is the number of audience members bobbing around in the pool itself. This could have been so tacky in other circumstances: ‘Come to the Titanic Pool Party!! !’ But the members sit still — or as still as they can in water — some treading water, some holding floatation devices, one prone on a lilo as if life had left. There is something rather remarkable about these people, as if the lovers of water have gathered to commemorate and memorialize those lost to the water. I was afraid that this would have been the one time that a Titanic performance ‘jumped the shark’, but it’s really a good addition to the history of the piece.